I probably eat four to five whole bell peppers a week on average, at least. That’s not counting any that are eaten while dining out or while making a meal at home. At least once a week, I make a batch of roasted peppers. I put them in a container, let them steam and then take them out, peel their skins off and slice them into bite-size pieces. I dip them in hummus, I salt and pepper them, I put mustard on them, I wrap them with turkey slices. Any way possible, I’ll have them. Long story short, I’m so obsessed with bell peppers that I can’t believe it’s taken me this long to post up a recipe. Time just flies when you’re having fun, don’t it? 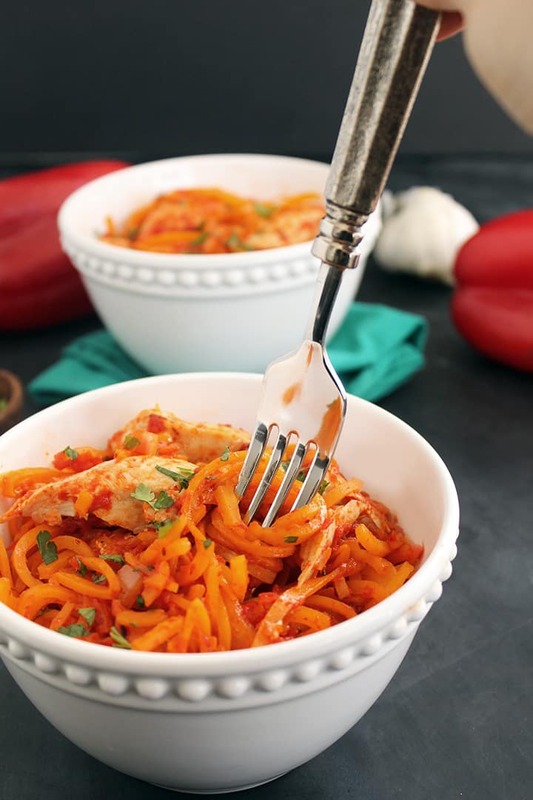 Roasted red pepper sauce is among the classics when it comes to pasta dishes. It’s light and healthy. The seemingly bland flavors of the bell peppers are transformed once roasted and the robust taste is incredible. 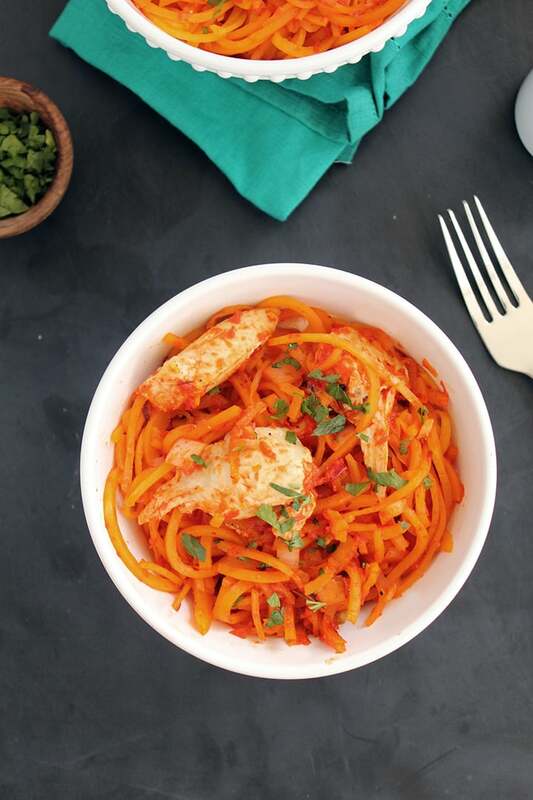 The butternut squash noodles soften when roasted and make that beautiful light consistency. The heartiness of the chicken is the perfection addition to this pasta. Chopped parsley goes a long way here, finishing up the dish and adding that additional freshness to this winter pasta. Honestly, while I’m looking forward to zucchinis being back in season (I’m counting down the days to summer, can you tell? ), I’m going to miss my winter veggies. I’ve been having fun with butternut squash, beets and sweet potatoes. Later this week, I’m bringing you some turnips, too. Who am I kidding? I can’t wait for the zucchinis! 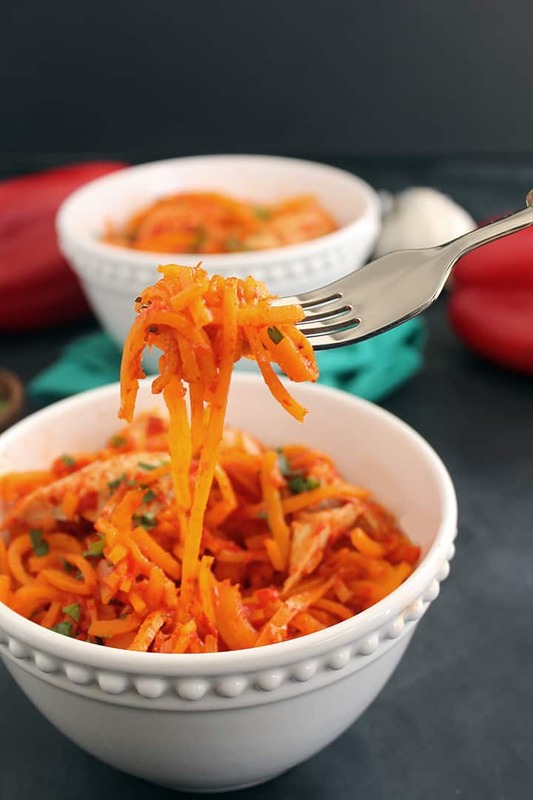 Are you enjoying your winter spiralizing? What have you tried? Preheat the oven to 400 degrees. Cut the bottom and tops off the bell peppers, remove the seeds inside and place on a baking tray lightly coated with cooking spray. Place the peppers insides up. Roast for 25 minutes. While the peppers are roasting, place your butternut squash noodles on a baking tray. Drizzle the noodles lightly with olive oil and season with salt, pepper and garlic powder. When the peppers are done roasting, place the noodles into the oven and roast for 10 minutes. When done, remove from heat and place into bowls. When the peppers are done roasting, place them into a food processor and pulse until no major chunks are left. Then, place a large skillet over medium heat and add in the olive oil. Then, add in the garlic, red pepper flakes and onions. Let cook for about 3 minutes and then add in the pureed red peppers. Stir to combine and then add in the chicken broth and chicken. Cook for another 2 minutes to heat up the chicken. 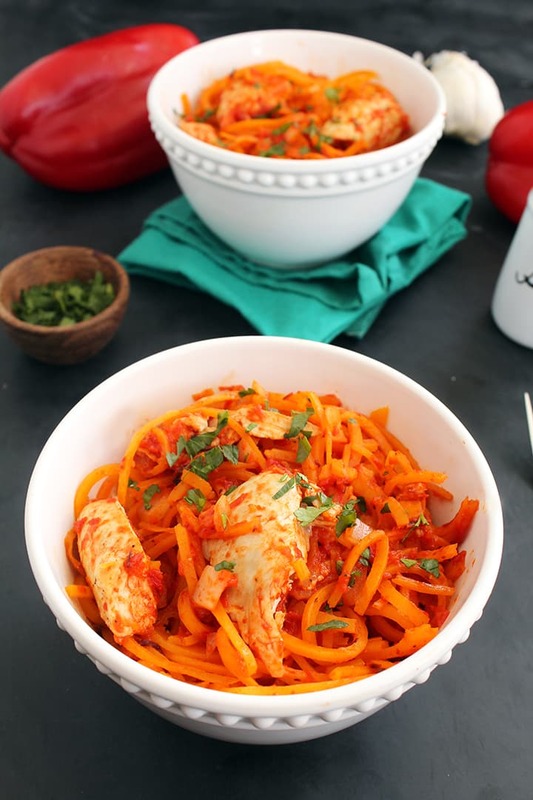 Pour the red pepper sauce and chicken mixture over the bowls of butternut squash noodles. Top each with freshly chopped parsley, to garnish. This looks super yummy! Do you peel the roasted red peppers before you puree them? No, I don't - it's easier that way! Roasted red peppers really do have the best flavor! I love this sauce! So perfectly paired with butternut. Just made this recipe and it is THE most delicious dish!! The only thing I did different was use coconut oil instead of olive oil on the noodles before sticking them in the oven and it created the best flavor! Oh, I bet it would add a lot of flavor! Glad you liked the recipe! I cooked this last night. It was fabulous. Thanks. Yay, glad you like the recipe. Which blade is considered blade C? This was fabulous! I have always liked roasted red peppers but they are amazing pureed like this into a sauce. I used sweet potatoes because my local shop didn't have any butternut squash and it worked out great. Thank you! Thank you so much for featuring me, I really appreciate it! 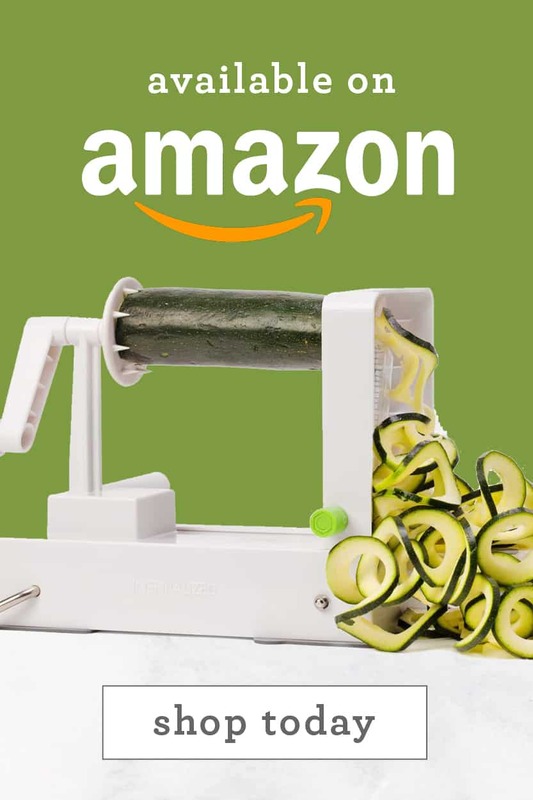 Glad you like spiralizing! 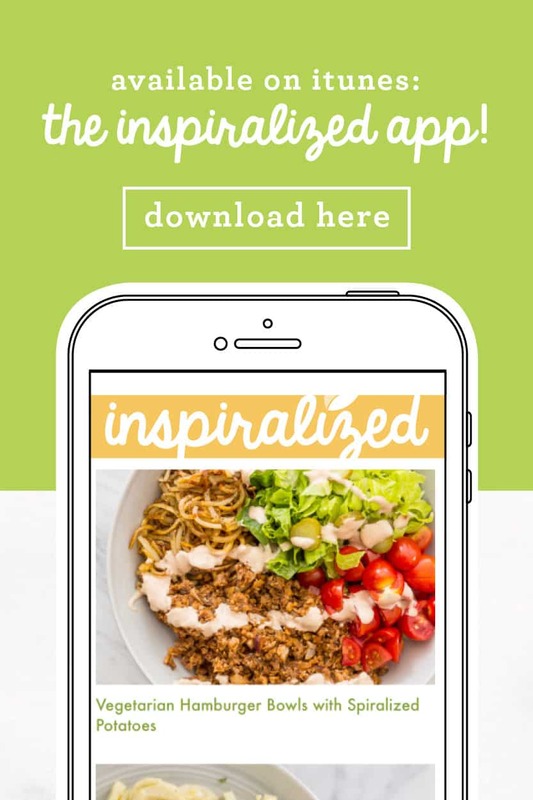 I just bought a spiralizer and your site was the inspiration. I follow the McDougall low fat plant based program, so I made some modifications. No oil, no chicken, sub veggie broth for chicken stock. I also used shallots instead of the onion since I had some that I needed to use. I lined my cookie sheet with parchment paper to keep the noodles from sticking. I loved the dish. Very intense flavors. I'm excited to try more of your recipes. I have more butternut squash to use (I bought two since it is the end of the season and I love them). I also bought a ton of zucchini. I can't wait. 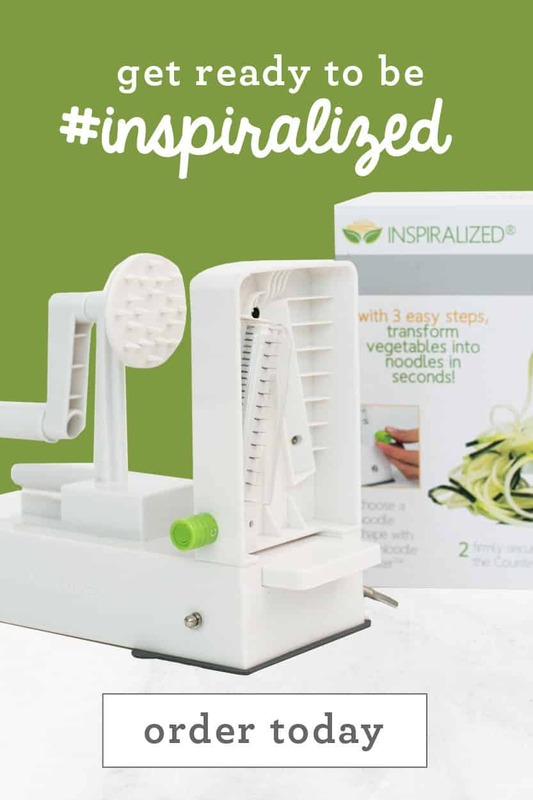 I just got a spiralizer because I was recently diagnosed with a digestive disorder known as Gastroparesis. I also am a Type 1 diabetic, so a meal of pasta is not in my wheelhouse. 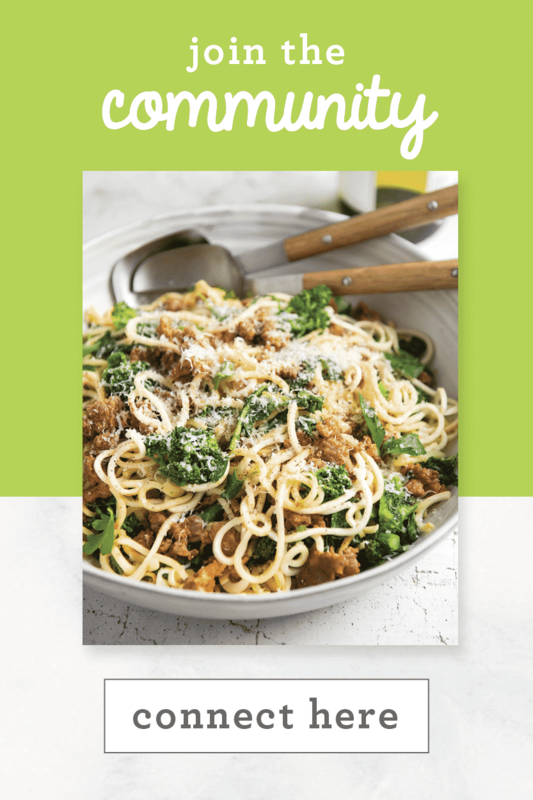 This recipe is going on my menu this weekend for sure! I will have to peel the peppers after roasting, but that's easy. I will also post my results on my blog. 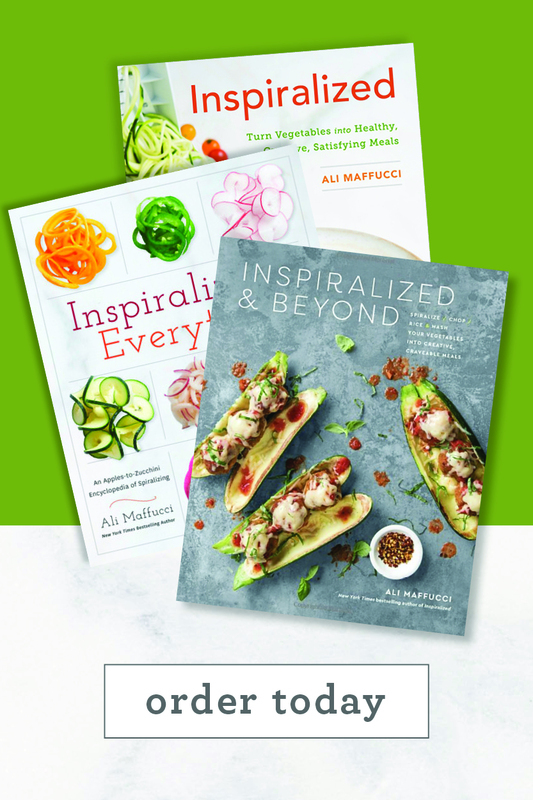 Thanks SO much for some wonderful ideas for foods I can actually eat! I can't wait to try zucchini too! 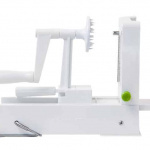 Ali, the past two times I have tried to spiralize a butternut squash, I can't get the spiralizer to turn. It's like the squash is too hard or something. The handle just spins but the squash doesn't move. Have you ever had this happen with a butternut squash? The first couple of times I did it, it worked fine. I'm wondering if the last few haven't been ripe enough??? Thanks so much for any advice you have. Your website ROCKS!!! Did you ever find out the answer to this question? I am having the same trouble with butternut squash. When I have to spiralize a hard vegetable like butternut squash or rutabega I just microwave If first until a little softer. It tried it with a rutabega and I did it a couple of minutes. I tried it and still too hard. I did it another minute or two and it worked great. Let it cool off though. The good thing about those hard noodles is they hold up really well. Those noodles from the harder vegetable are really great. My husband prefers them! It definitely does, but I'm glad you found it worth it! Made this last week and making it again tonight! Do you have the nutritional info? 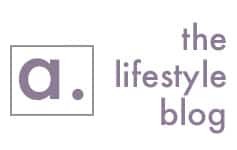 Hello, I am totally in love with your website, I think it is fantastic! 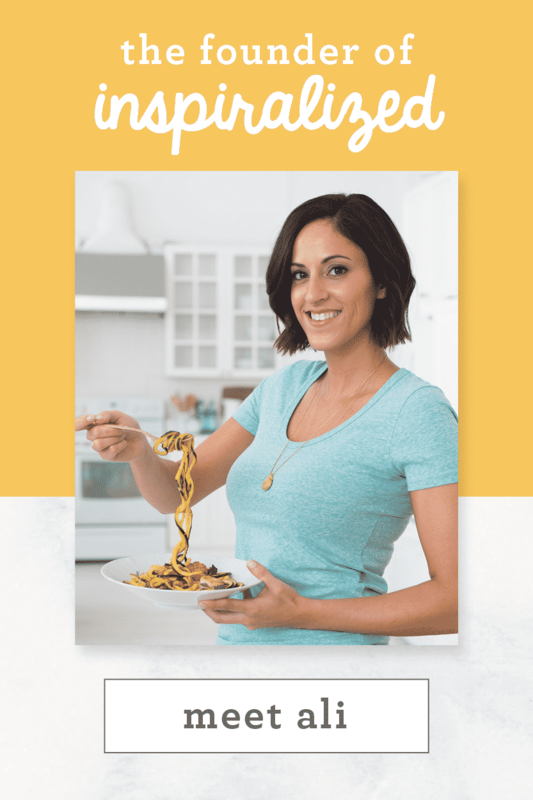 I have a question about spiralizing a butternut squash. Do you have any tricks to make the "noodles" come out more separated? Mine seem to come out stuck together and its kind of difficult to separate them. Any tips would be greatly appreciated! My wonderful husband just made this for dinner. It tastes absolutely wonderful. 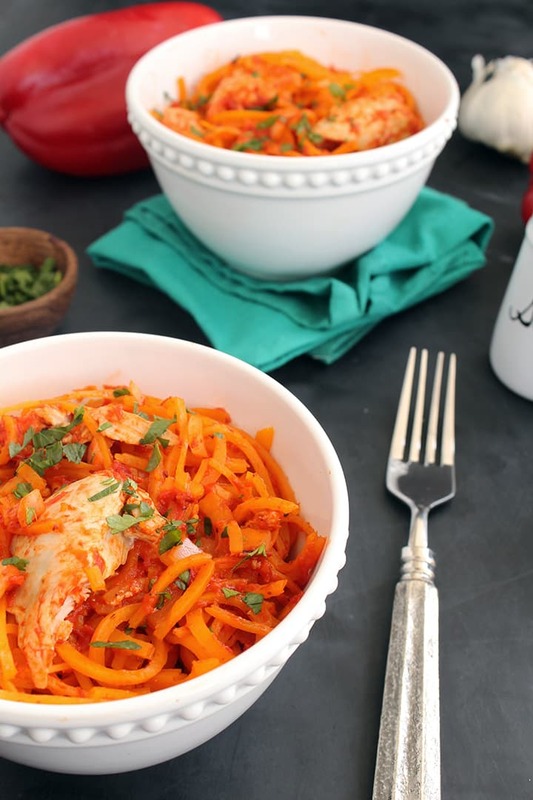 It was our first time making our own roasted red pepper sauce, and we love it. Thank you! This is so fabulous to hear! And a husband who cooks for you? What's better?! This calls for 1 large butternut squash. Is it really only for one person or can you separate that into at least 4 servings? I haven't spiralized a squash yet so I'm not sure of the yield. Thanks!